Good news to those people who often get allergies when they are in an air-conditioned environment. Finally there is no need for you to undergo the same ordeal again. You can now upgrade your air-conditioning unit to a model that not only cools the air but also gets rid of harmful bacteria. A lot of airborne—and potentially dangerous—viruses, allergens, and bacteria are present in our environment today, making necessary protection from the health risks they bring, especially to our kids. Today, Sharp (Phils.) Corporation has air conditioners bring not only cool but also clean air to homes, offices, and any type of establishment on any given day and weather. 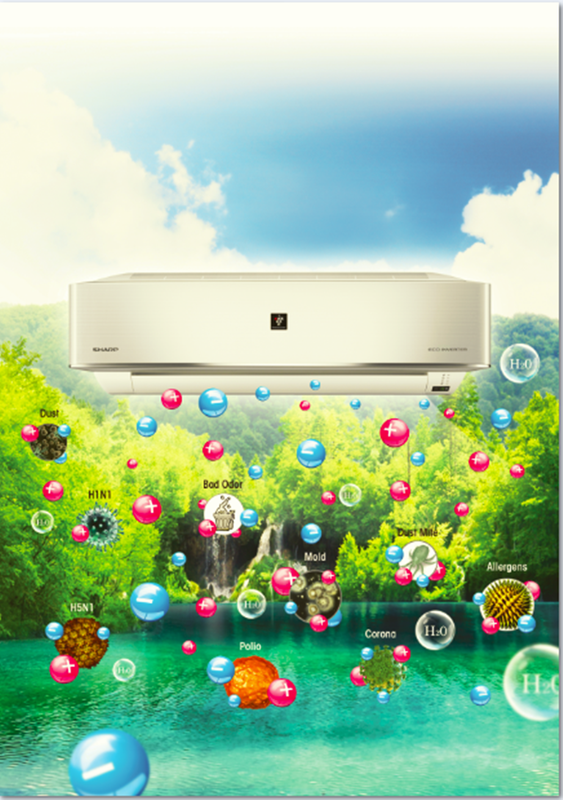 Its impressive line of air conditioning products offers enhanced and “healthier” cooling efficiency compared to other brands in the market today. What sets Sharp air conditioners apart from other brands today is the air purification system called Plasmacluster Ion (PCI) technology, a technologically advanced airflow filtration system that helps free the air from dangerous airborne threats. This helps produce cleaner and fresher air that’s 99 percent free from airborne threats – clean and safe air, inspired by nature, indeed. The PCI technology involves the generation of an electrical discharge that helps make and releases positive and negative ions into the air. These positively and negatively charged ions, similar to the ones found in nature, go after airborne bacteria and viruses, attach themselves to them to form highly oxidizing radicals, then finally draw out hydrogen, effectively breaking down the protein’s membrane to make them inactive. These hydrogen and oxygen radicals then combine with hydrogen and return to the atmosphere as water. Dust, pollen, and other forms of air contaminants are also some of Sharp air conditioners’ targets. The charged ions neutralize static electricity to help prevent these contaminants—even odors—from sticking to walls and fabrics for easy collection and filtering. Because PCI technology mimics how nature cleanses the air around, it allows us to breathe fresh and clean air that is safe and chemical-free. This makes PCI air conditioning units ahead of others in the market. A lot of people, especially in enclosed, air-conditioned rooms, will be happy to note that Sharp air conditioners are effective in protecting the home and the family, the workplace, and other establishments like airports, museums, and other public places, from unhealthy air. Besides PCI technology, Sharp air conditioners are also equipped with Powerful Jet Stream Technology which makes everyone in the room feel cool, regardless of where they are located. The Powerful Jet Stream Technology has a strong and direct airflow that instantly cools the body and the room 30 percent faster than the conventional split-type air conditioners. The Coanda Technology, on the other hand, throws cool air through a soft, indirect airflow from far distances to provide soothing coolness to the room, which works best for babies and sometimes the elderly. Finally, the Inverter Technology enables faster and quicker cooling, reduces start-up time, and promises effective energy operation by avoiding the cycling of compressor. The process also helps you avoid power surges, thereby saving you energy and more money. All these technologies designed to make the customer’s life more comfortable are available in each Sharp Deluxe Split-Type Air Conditioner, as part of the company’s “Our Brand, Our Pride” philosophy; this is a commitment to uplift the quality of life of Filipinos by providing them with exceptional home appliance products – no frills, no fuss, just simple engineering marvels for you and your family. To find out more about Sharp’s outstanding line of air conditioners and other home appliances, visit www.sharp.ph.